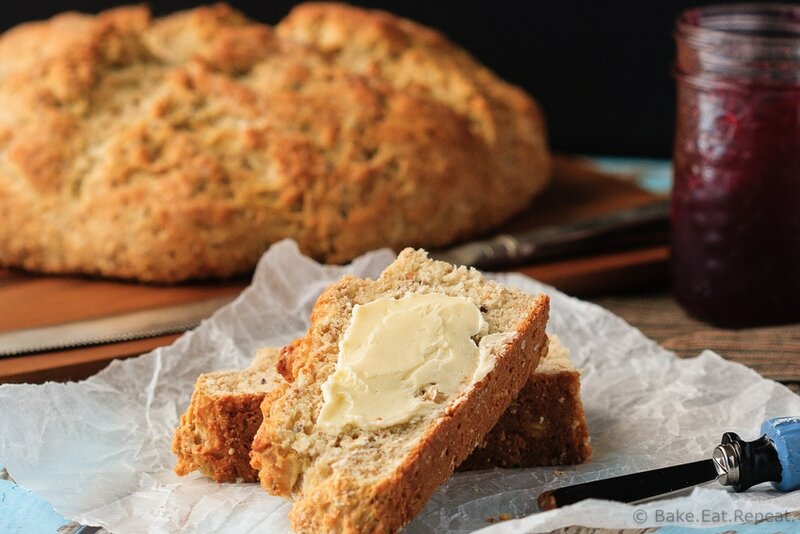 Quick and easy whole wheat soda bread – this bread mixes up in minutes and tastes fantastic! An easy side dish that you can make in no time! So, St. Patrick’s Day is coming up next week – hence the Chewy Chocolate Mint Chip Cookies earlier this week. Besides the random green cookie though, we don’t really do anything. The kids’ll wear something green to school I suppose, but that’s about it. But….I happen to really love soda bread so I couldn’t let another year pass by without sharing my personal favourite version of it. I know it’s supposed to be baked in a cast iron pan, but I’m living in a temporary place right now with most of my dishes in storage and I don’t have one here. I know you’re supposed to put currants in soda bread, but I don’t really like them in it, so I didn’t. So….yeah. Not really a traditional soda bread recipe that I’m sharing I suppose. But it tastes fantastic and that’s all that really matters I think. Full of whole wheat (or multigrain) flour and oats, this bread takes less time to mix up then it takes to heat up the oven. Served warm with lots of butter, it’s the perfect answer to the “what should I serve with supper?” question. Because I’m sure I can’t be the only one asking that question almost every night. The main dish is always fairly easy to plan, it’s those side dishes that are sometimes difficult, right? And when I can’t think of something to serve, my mind usually turns to carbs! Whether you need something for St. Patrick’s Day, or just need a quick and easy side for supper tonight, this whole wheat soda bread is amazing. And…it’s also fantastic with butter and jam for breakfast. Just saying. 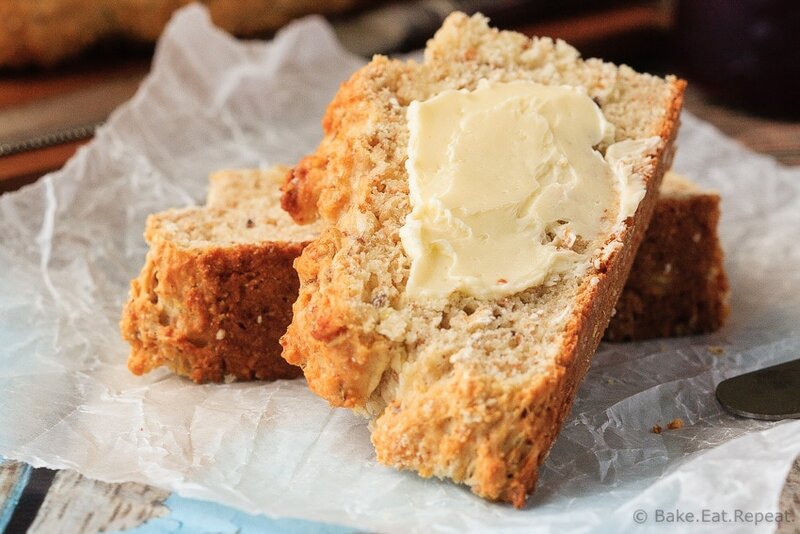 Quick and easy whole wheat soda bread - this bread mixes up in minutes and tastes fantastic! An easy side dish that you can make in no time! Preheat the oven to 400 degrees F and line a baking sheet with parchment paper or a silicone mat. In a large bowl, combine the flours, oats, sugar, baking soda, cream of tartar and salt. Add the 2 tablespoons of softened butter and rub it into the flour mixture with your fingers until it is well combined. Make a well in the middle of the dry ingredients and pour in the buttermilk. Stir until it is just combined, it will be sticky and uneven. Turn the dough out onto a lightly floured surface and gently pat it into an 8 inch round with floured hands. Transfer it to the prepared baking sheet and cut a 3/4 inch deep cross into the top of the loaf with a very sharp knife. Bake the loaf for 40-45 minutes or until a knife inserted in the center of the loaf comes out clean. Brush the baked soda bread with the 1 tablespoon of melted butter and transfer it to a wire rack to cool. Allow it to cool for at least 30 minutes before cutting into it. Serve warm. I rarely have buttermilk on hand, but if I do I’ll use it here. A good substitute for the buttermilk is to mix milk with 1 tablespoon of white vinegar and let it sit for about 5 minutes. Source: Adapted from Cook's Illustrated Baking Book . This looks and sounds delicious! Love soda bread. Is there anything I can use in place of cream of tartar though? I haven't tried it in this recipe, but from looking at other soda bread recipes I think you could replace it with baking powder without a problem. Soda bread recipes seem to have all baking soda, or a combination of baking soda/cream of tartar or baking soda/baking powder so I think that it would work just fine with baking soda and baking powder instead. Let me know if you try it out! Love a classic soda bread. This looks delicious! I don't really do much for St. Patrick's Day either, except maybe have a green beer! 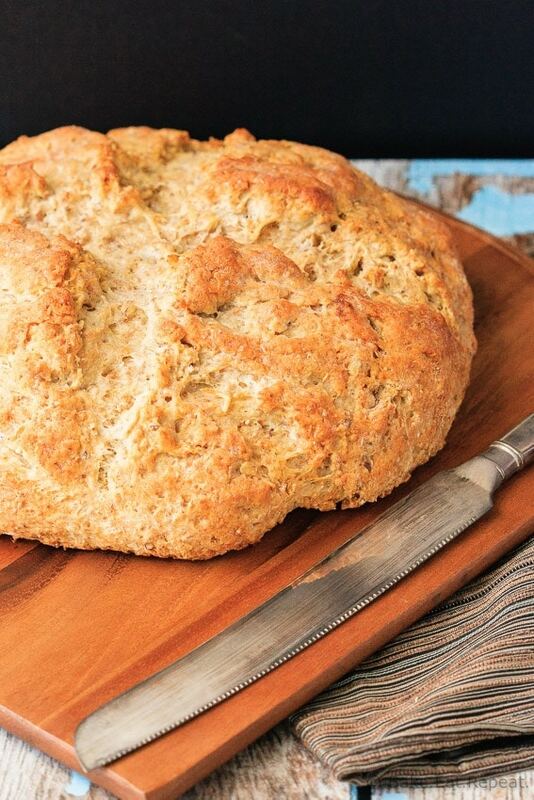 :) This soda bread looks delicious! I've never made my own before and I'm not a fan of the kind with raisins, so this sounds perfect!